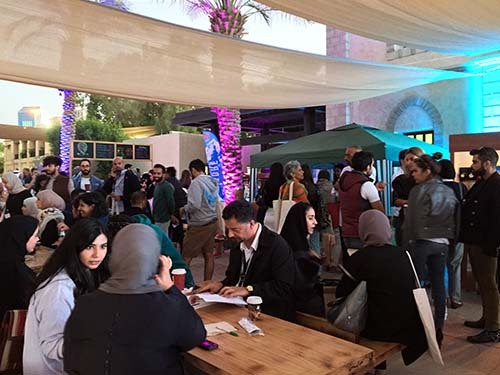 It's a breath of fresh air that attracted art, culture, design and creativity aficionados to Nuqat's conference in Kuwait amid a storm of insanity engulfing the Middle East. 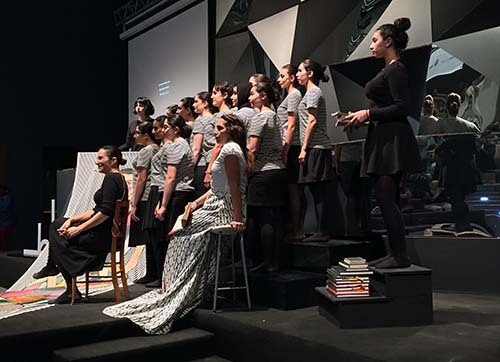 The sixth edition this month was a three-day pageant with a follow-up series of workshops that evolved from a little known secret to a full-fledged inspirational manifestation of what the human mind can conjure and create. "I draw for three reasons: reflection, self-preservation, and narrative," said Ghadah Alkandari, a Kuwaiti artist and creator of the Prettygreenbullet blog, who admits to being influenced by Matisse and Cezanne as well as comic books MAD Magazine, Archie and Astérix. The globetrotting Alkandari is known for her traveling tapestries, sketchbooks, storybook drawings and "Stories of Eves" collection depicting what she said was one of the happier periods of her life. 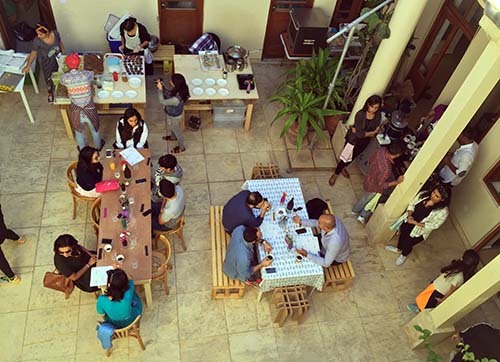 Egyptian Architect Manar Moursi's fascination with urbanism, design and art led her to collaborate with Dominican David Puig to present their view of the public space through street chairs in Cairo. The photographic project that resulted in a book entitled "Sidewalk Salon: 1001 Street Chairs of Cairo" was inspired by walking, which Moursi described as "a very physical experience" and through which she and Puig discovered the various permutations of ordinary chairs used on city streets. Researcher Nadim Damluji, who writes on the history of Arab comics, weighed in with views that Arabic-language renditions of popular American and European comics reinforced stereotypes, adding that translations were a Trojan horse whose intended audience was angry men. 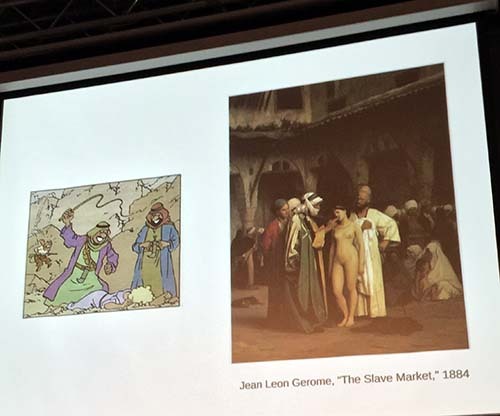 "You can't just copy and paste, you must have a conversation," he explained, noting that classics like Belgian Tintin's depiction of Arabs resembled Orientalists' negative views. 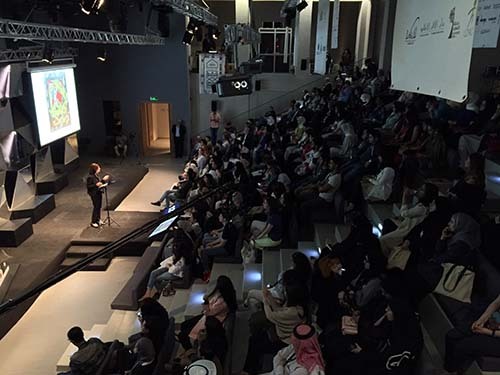 The rich conference packed a powerful punch of 26 lectures ranging from fashion design to curation, social activism, anthropology, product design, social design, architecture, photography, creative education and musicology. This year's theme, the "Copy and Paste Syndrome," shed light on the pros and cons of creative imitation, with speakers noting that mimicking doesn't necessarily mean outrageous stealing of content. Organizers said the theme was meant to examine how imitation both inspires and limits creative production. 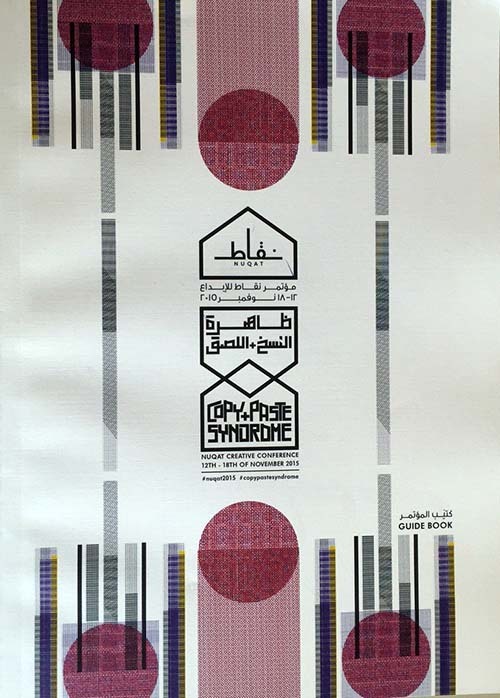 At this year's Nuqat conference and workshops, we will use the process of "Copy + Paste" as a departure point for questioning topics including originality, authorship, and the artist signature; social trends and business franchises; development of critical thinking in schools; creative copyright laws in music and fashion; virtual reality and simulation. Ptolemy, for example, was copied by the Arabs, and the Medieval Islamic world was a wellspring of astronomy, optics, and geometry that benefited later civilizations around the world. 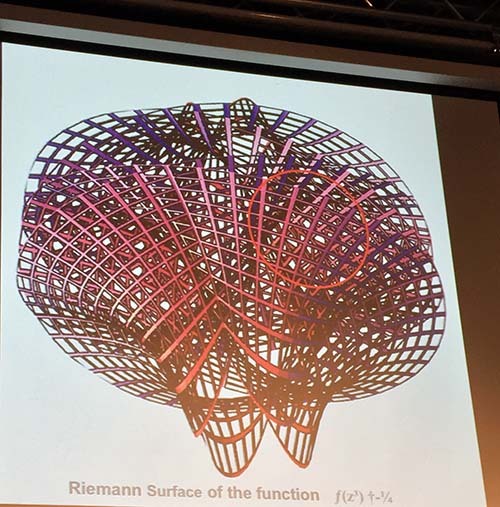 Egyptian architect, designer and author Tarek Naga provided an elaborate explanation of Arab and Islamic world geometry using the Riemann surface as a model to explain historical designs. 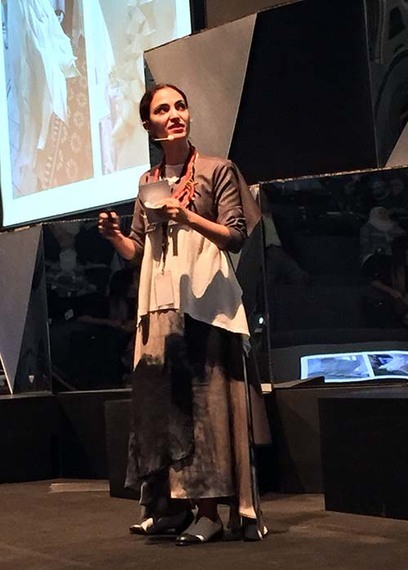 Lebanese fashion designer Rayya Morcos told participants her first job was at an interior design firm where she copied and pasted content before tiring of the process and shifting gears to fashion. She established her Bird on a Wire label of wearable sculptures. "I'm inspired by all manner of ideas and concepts," said the designer of square T-shirts. "I'm complexed by copying. I can't recreate an already finished design, but can be inspired by it." Since tastes differ, one can't judge based on personal biases but on one's education, she added. Curator Rana Sadik said there was more information on contemporary Arab art in English than there was in Arabic, and that Western institutions influenced how Arabs wrote about contemporary Arab art because they were the frontier granting institutions. On collecting, she noted that while Western societies emerged from the Dark Ages into the Renaissance, they started collecting again, whereas collecting and spaces for collections emerged in the Arab world during its darkest times, meaning the levels of violence and migration did not create environments conducive to producing or receiving art. Product designer Leen Sadder, who operates in Dubai, Beirut and New York, came up with a creative twist to an old item that is being put into production and marketed with vigor. It prompted participants to consider whether her venture was imitation, revival or modernization of a traditional product. 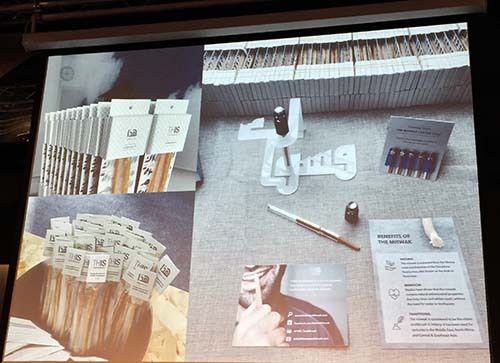 This is a toothbrush site focuses on "health and heritage revisited" and promotes the traditional miswak, considered the first documented form of dental hygiene - the oldest toothbrush in history - and still used in the Middle East, North Africa, and Central and Southeast Asia. It is part of the Sunni Muslim tradition. The conference provided a selection of live arts and musical entertainment in a courtyard outside the main event's theater where attendees savored snacks and browsed through a gift shop of art and culture books. It also featured evening gallery openings and visits, book signings, poetry readings, film screenings, and music concerts. Nuqat (Arabic for dots) is a Kuwait-based non-profit organization launched in 2009 and dedicated to the development of creativity in the Arab world: in design, advertising, architecture, fashion, and production. It was founded by Lebanese Wakim Zeidan and Kuwaitis Sarah Al Nafisi, Hussah Al Humaidhi, and Dana Al Hilal.